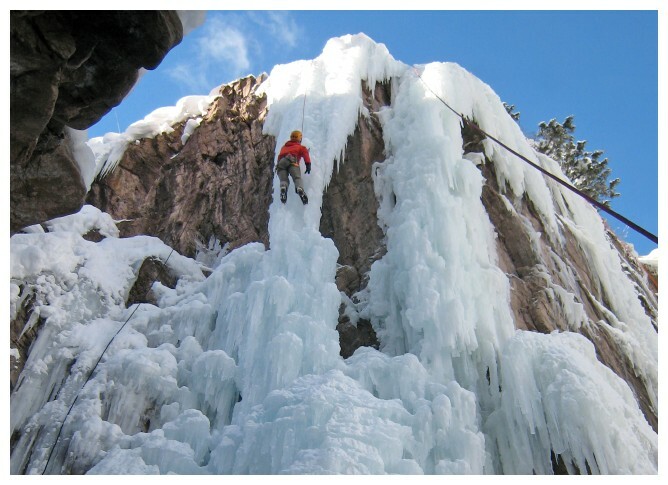 This weekend I went to Colorado to participate in the 13th Ouray Ice Festival. 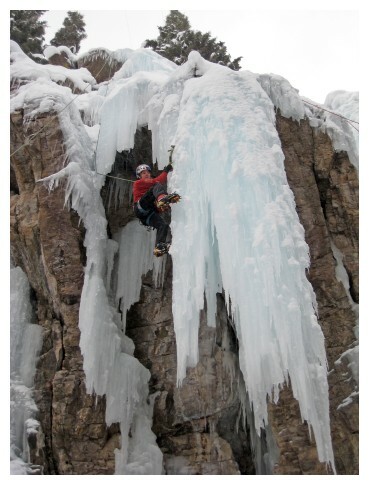 The festival is an awesome event where the best ice climbers in the world gather to give (almost) free clinics, compete on a spectacular mixed route and give excellent presentations of their adventures. In addition all vendors of ice climbing equipment, boots and clothes with respect for themselves have booths where you can demo all the new stuff for free. Quite nice to try the gear before you shell out 100’s of dollars on new stuff! In the evenings there are even auctions where you can make good deals on the vendors gear. I mainly came to the event to participate in the clinics. They sell out quickly but I was ready at my computer when the online reservation system opened on November 5! 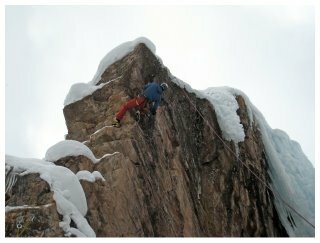 I was thus fortunate enough to get on three clinics on mixed climbing / drytooling (with Will Gadd and Paul Stein), one clinic on advanced ice climbing with Roger Strong and one clinic on avalanche awareness for climbers by Matt Wade. They were all great and I learned a lot. Most importantly, my mixed climbing skills progressed a lot this weekend and in the end I was able to top-rope the M7+ route Jesus built this crack which is a great improvement for me! Great as I need these skills for my upcoming Alaska project! Think 1-3 moves ahead before you move up on your drytool placement and execute the upward move fast. In this way you spend as little time locked off as possible. Look for ice eyebrows (= a small “wave” of ice) on rock ledges (you will often find them under snow) – they make good hooks if you carefully tap your ice tool into them just above the brow/wave. Be careful when climbing free hanging ice curtains – do not use excessive force with your tools or crampons or they will fall down! 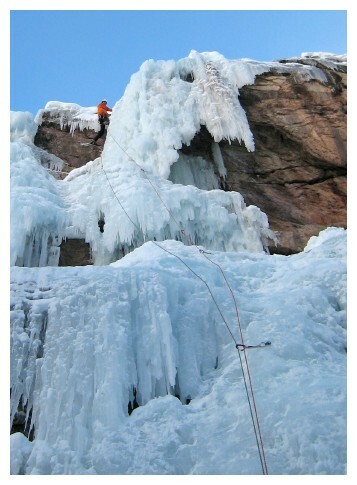 Place ice screws above the break line (= where the ice is attached to the rock). Use your feet!!!! Train climbing without ice tools to force yourself to use the feet. “Even WI5 can be climbed without ice tools” (I climbed a WI4+ without tolls during the workshop – great fun). The best way to train for mixed climbing is to spend as much time on your tools as possible – be creative at home! Execute fast to minimize lock-offs! Be creative in how you place your picks but avoid putting your head in front of the tool and pointing the pick of the ice tool towards yourself – it might pop! Move your body around the tool placement in a way so you make sure that the pressure remains in the same direction (= the direction you have weight tested) all the time. If you change hand on the ice tool try to minimize the change of direction of the tool. If it shifts away from the direction you have weight tested it might pop. Shake out when you have a good placement and climb fast past small/insecure placements. Save energy by stemming up with your leg muscles rather than pull up with your arms. Save energy – swing one tool and take two steps up (= stack your tools). Build a triangle with the tools stacked above and your feet spread out below. Don’t grip the tools too hard – it is not necessary and will burn out your hand muscles fast. 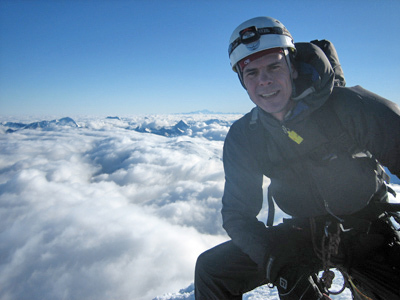 Be careful when climbing thin pillars – tap lightly with your tools and crampons (after which I got to climb a virgin 6-8 inch thick WI6 pillar, only climbed by Roger before me, which was lots of fun). Look for cracks before you climb it! Good vertical ice screw placements are often found behind the base of pillars. Do not put screws in the pillar – but below the pillar and above the breakline (= where it touch the rock). 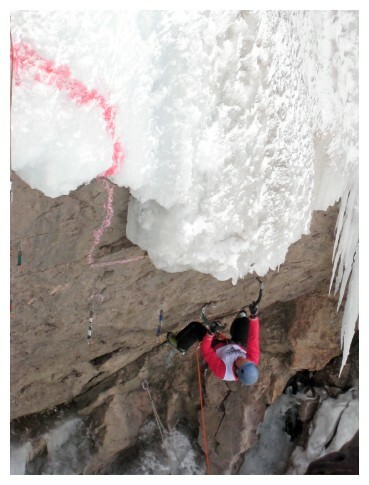 In this case we would have had to climb 20 feet between ice screw placements if we were to lead the pillar. I also got to see some of the competition. It was a great inspiration to see the best climbers of the world onsight the finalist route which contained sections of ice, rock, timber, plywood and indoor climbing holds! It was particular funny to see the two climbers Will Mayo and Rich Marshall who each lost one of their tools at the end of the route. It was quite amazing to see them continue up the timber logs and plywood with one tool albeit they both fell off before the final hold. But what an effort! Finally, you are of course free to climb on your own in the park during the festival. I climbed with my Danish friends Line Antoft and Martin Ploug and got to lead a WI4 route and the WI4+ route We’re number one. The ice was quite airy this year compared to my three previous visits to the park and finding good ice screw placements was thus the crux on both routes! All in all the weekend was lots of fun and a great warm-up for my upcoming 1-month ice climbing trip to Banff, Canada in February. Click here to see a slideshow of pictures from the event.